As far as the public knew, Britain’s Special Operations Executive (SOE) did not exist. After the defeat of the French Army and Britain’s retreat from the Continent in June 1940, Prime Minister Winston Churchill created the top-secret espionage operation to “set Europe ablaze.” The agents infiltrated Nazi-occupied territory, parachuting behind enemy lines and hiding in plain sight, quietly but forcefully recruiting, training, and arming local French résistants to attack the German war machine. SOE would not only change the course of the war, but the nature of combat itself. Of the many brave men and women conscripted, two Anglo-American recruits, the Starr brothers, stood out to become legendary figures to the guerillas, assassins, and saboteurs they led. While both brothers were sent across the channel to organize against the Germans, their fates in war could hardly have been more different. Captain George Starr commanded networks of résistants in southwest France, cutting German communications, destroying weapons factories, and delaying the arrival of Nazi troops to Normandy by seventeen days after D-Day. Younger brother Lieutenant John Starr laid groundwork for resistance in the Burgundy countryside until he was betrayed, captured, tortured, and imprisoned by the Nazis in France and sent to a series of concentration camps in Germany and Austria. Feats of boldness and bravado were many, but appalling scandals, including George’s supposed torture and execution of Nazis prisoners, and John’s alleged collaboration with his German captors, overshadowed them all. At the war’s end, Britain, France, and the United States awarded both brothers medals for heroism, and George would become one of only three among thousands of SOE operatives to achieve the rank of colonel. Yet, their battle honors did little to allay postwar allegations against them, and when they returned to England, their government accused both brothers of heinous war crimes. Here, for the first time, is the story of one of the great clandestine organizations of World War II, and of two heroic brothers whose ordeals during and after the war challenged the accepted myths of Britain’s wartime resistance in occupied France. 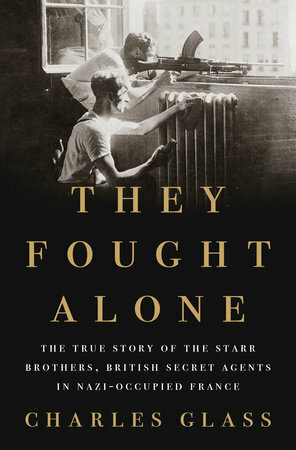 Written with complete and unrivaled access to only recently declassified documents from Britain’s SOE files, French archives, family letters, diaries, and court records, along with interviews from surviving wartime Resistance fighters, They Fought Alone is a real-life thriller. Renowned journalist and war correspondent Charles Glass exposes a dramatic tale of spies, sabotage, and the daring men and women who risked everything to change the course of World War II.